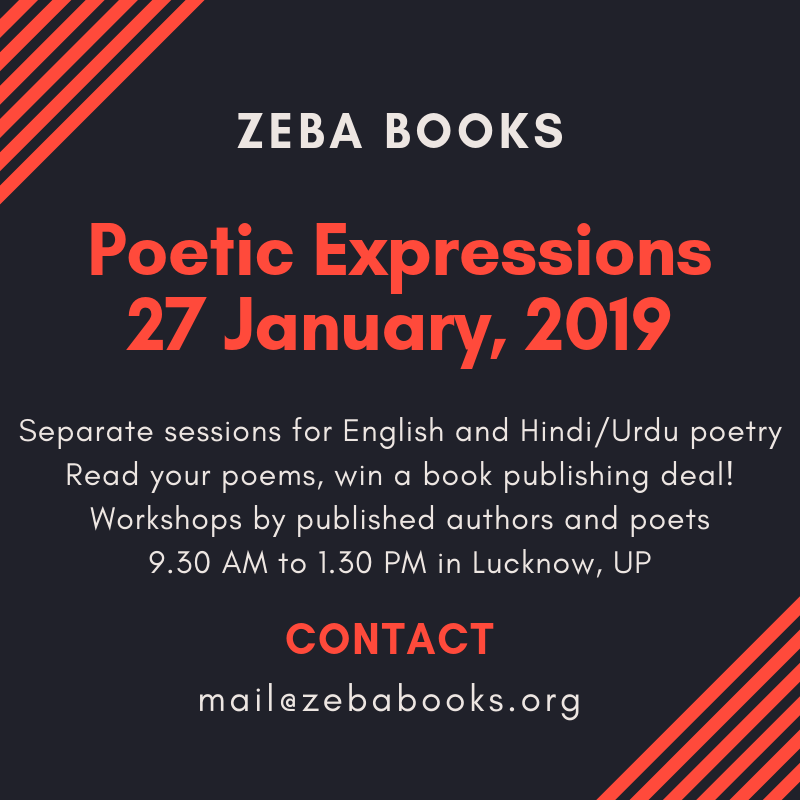 On 27th of January, Zeba Books is organizing a one-day Poetry Workshop and Open House event in Lucknow, UP. Aptly named Poetic Expressions, this particular event is a must-attend for all aspiring poets and poetry lovers! TL;DR – January 27, 2019 is the date, and Hotel Bodhi Inn (Gomti Nagar, Lucknow) is the venue! But what makes Poetic Expressions special? Well, here are some highlights of what’s in store! Workshops to help aspiring poetry enthusiasts hone their skills. Topics covered will include the basics of poetry, how to promote and publish your works, how to write meaningful poems, how to make money as a poet (just in case you want to), and more! Open House sessions wherein attendees will get a chance to read and showcase their poems (pre-registration mandatory; simply fill up this form). Separate sessions for English and Hindi/Urdu poetry. Special focus on young and upcoming poets, especially teenagers and folks in their early-20s. Sounds good? Wait, there is more! The best poems from the Open House session will be shortlisted for publication in our upcoming poetry anthology. This means you have a chance to get your poems published in a book, alongside other amazing verse specialists! Top poets will also be provisionally offered a book deal by Zeba Books – what better way to get your works published? Certificate of Participation for all attendees. Registration fee is Rs 200 per candidate. Furthermore, pre-registration is mandatory to help us allot an Open House slot. Interested poets may pre-register by filling this form. Please be informed that slots are limited.